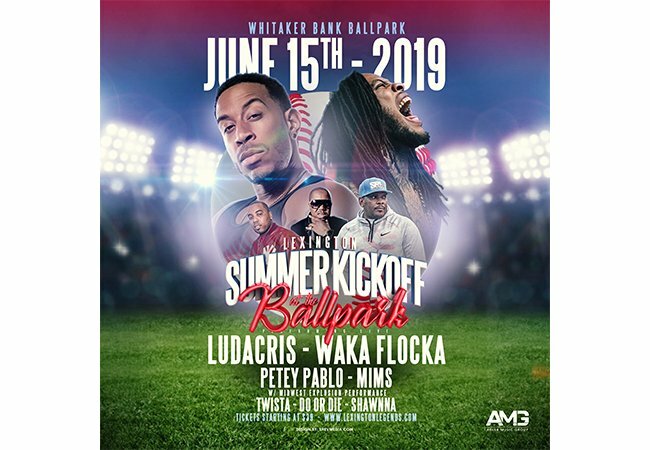 WHITAKER BANK BALLPARK (Lexington, KY) – The Lexington Legends are excited to announce ‘Summer Kickoff at the Ballpark’ featuring Ludacris, Waka Flocka, Petey Pablo, MIMS, Twista, Do or Die and Shawnna. Tickets go on sale Friday, April 19 with prices as low as $39 and can be purchased online at www.lexingtonlegends.com or in person at Whitaker Bank Ballpark. Ludacris has recorded #1 Billboard hits such as “Money Maker,” “Stand Up,” “Runaway Love,” and “Break Your Heart.” He released his first album Incognegro in 1999, followed by Back for the First Time also in 2000, which contained the singles "Southern Hospitality" and "What's Your Fantasy". In 2001, he released Word of Mouf, followed by Chicken-n-Beer in 2003 and The Red Light District in 2004. Two years later he released Therapy (2006), then Theater of the Mind (2008). His next record, Battle of the Sexes, was released in 2010 and Ludaversal was released on March 31, 2015. As an actor, he has appeared in films including Crash (2004), Gamer (2009), and New Year's Eve (2011) and is best known for playing Tej Parker in The Fast and the Furious film series. Signing to 1017 Brick Squad and Warner Bros. Records in 2009, Waka Flocka became a mainstream artist with the release of his singles "O Let's Do It", "Hard in da Paint", and "No Hands", with the latter peaking at number 13 on the US Billboard Hot 100. His debut studio album Flockaveli was released in 2010. His second studio album Triple F Life: Friends, Fans & Family was released in 2012 and was preceded by the lead single "Round of Applause". After getting signed to Jive Records, Petey Pablo debuted his first single "Raise Up" in summer 2001, which was produced by Timbaland and even reached number 25 on the Billboard Hot 100. Petey Pablo's debut album Diary of a Sinner: 1st Entry peaked at number 13 on the Billboard 200 and was certified Gold by the RIAA. In early 2003, Petey Pablo's debut album received a Grammy nomination for Best Rap Album. He would continue his success with the release of his second studio album, Still Writing in My Diary: 2nd Entry which he started working on in 2003. The album was a critical and commercial success, peaking at number 4 on the Billboard 200 and was certified Gold by the RIAA. The lead single off the album, "Freek-a-Leek", produced by Lil Jon ended up being Petey Pablo's biggest hit single of his career by reaching number 7 on the Billboard Hot 100. MIMS release "I Did You Wrong" in 2003 thanks to help from the Miami-based production team the Blackout Movement, and in 2006 the rapper independently released the single "This Is Why I'm Hot." The song did well enough on local radio stations, including New York's Hot 97, to garner attention from major labels, including EMI and Capitol Records, which released MIMS' full-length debut, Music Is My Savior, in 2007. Twista is best known for his chopper style of rapping and for once holding the title of fastest rapper in the world according to Guinness World Records in 1992, being able to pronounce 598 syllables in 55 seconds. In 1997, after appearing on Do or Die's hit single "Po Pimp", produced by The Legendary Traxster, Twista signed with Big Beat and Atlantic Records, where he released his third album Adrenaline Rush and formed the group Speedknot Mobstaz, in 1998. His 2004 album Kamikaze reached the top of the US Billboard 200 album chart, after the success of the Billboard Hot 100 #1 single "Slow Jamz". Do or Die is an American rap trio originally from the East Garfield Park neighborhood on the West Side of Chicago, consisting of group members Belo Zero, N.A.R.D. and AK. The group experienced mainstream success with the platinum single "Po Pimp", which peaked at #22 on the Billboard Hot 100. Shawnna was the first female artist signed to Def Jam South through Ludacris' Disturbing tha Peace Records. She is known for her rapid-fire delivery and is one of only seven female rappers (others being Left Eye, Lauryn Hill, Lil' Kim, Remy Ma, Iggy Azalea, and Cardi B) to ever have a number-one song on the US Billboard Hot 100, with 2003's "Stand Up" with Ludacris.